Yesterday the sky was such a beautiful shade of blue that I had to include it in a picture. 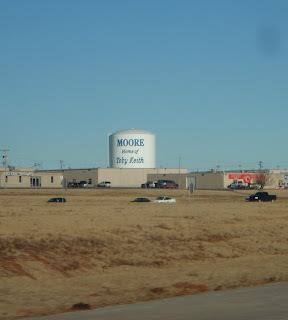 The three white stripes represent the neighborhoods in the three parts of the city: North Side, West Side, South Side. The two blue stripes represent Lake Michigan and the two branches of the Chicago River. 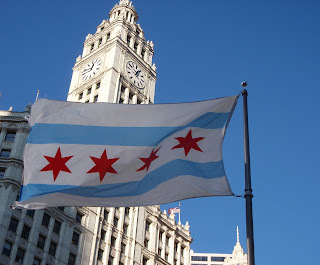 The four red stars are for Fort Dearborn, the Great Chicago Fire, the 1893 World's Fair, and the 1933 World's Fair. And yes, I had to snap a bunch of pictures before I got the flag with just the right wave to it. Went to visit Mt. Scott in Lawton, OK yesterday. At almost 2,500 feet, Mt. Scott towers over everything around. 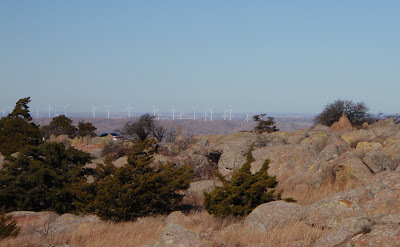 From the top, we could see the spinning blades of the Blue Canyon Wind Farm. Also took a trip through the Wichita Mountains Wildlife Refuge. It's a beautiful park. The buffalo were a bit camera shy, though. ... and there's only one James Garner. 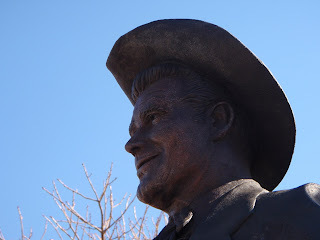 Edwards Park in Norman, Oklahoma is home to a life-size statue of James Garner. Chicago had a short-lived heat wave yesterday. The temps got into the high 30s. (Now where did I put my flip-flops?) It was enjoyable if you were standing still but a bit hard to walk in slushy snow and melting ice. 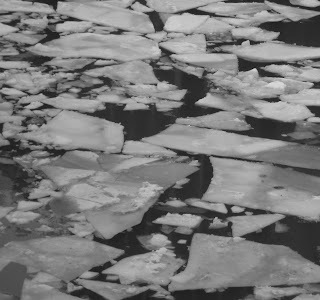 I was out navigating the ice patches and noticed how the ice on the Chicago River looked like pieces of an incomplete jigsaw puzzle. While I was taking the picture, another person walked by, said, "That is kinda interesting", pulled out a camera and took a picture, too. I was cutting through a building (again) to escape the cold. This time it was the Chicago Cultural Center. I found this great mosaic in the ceiling near the Washington entrance. 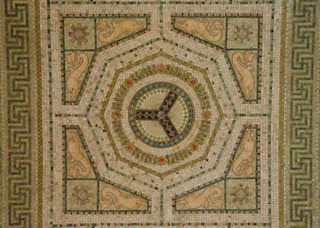 The ceiling also has mosaics of author names, like Longfellow and Irving, because the Cultural Center used to be the main Chicago Public Library. The tiny suns and dolphins in the corners gave it a tropical look and a nice escape from the brutal outside temperatures. The library is such a great, yet often overlooked, resource. My latest "discovery" is that the library has a huge cookbook selection. I can go, check out some cookbooks, try some of the recipes, make sure they work and that I like the results, and then return them. That way, if I like the book and the recipes, I can go buy it. If I don't like the book ... well that's OK because it isn't taking up precious shelf space in my personal "library". And, don't even get me started about how convenient it is to search the library catalog via the internet to see which library has the book before you head out. They've come a long way from those typewritten card catalog files. This particular library, the Harold Washington Library, also has a lot of art, interesting designs, and architecture. This isn't a hallway to the window. 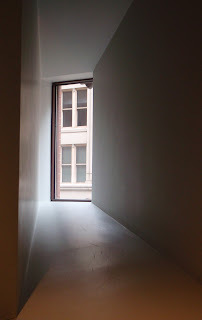 It's more like a long narrow window sill. I liked how the windows from the building across the street lined up so well (at my eye level -- someone taller or shorter wouldn't get the same view) and all the different angles. I couldn't tell if the owner of this bike had a lock on it or not. 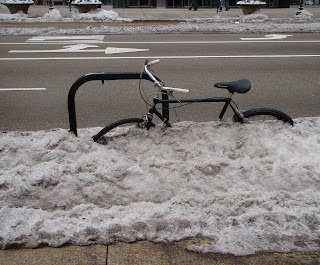 Even if there is no lock, this bike might be secure until, oh say, March? The good news is that the days start getting longer now (although it really isn't all that noticeable right away). The bad news is that the first day of winter is also the first day of a very cold streak descending on Chicago. This is the time of year when I re-familiarize myself with the lobbies of buildings that I neither work nor live in. I'll explain. A lot of downtown Chicago buildings take up the whole city block and have entrances at both ends. So on the bitterly cold or very snowy days, I walk through as many of these buildings as I can to avoid whatever conditions Winter is throwing at us that particular day. Depending upon where you are and where you need to go, you can do pretty well without going too far out of your way. 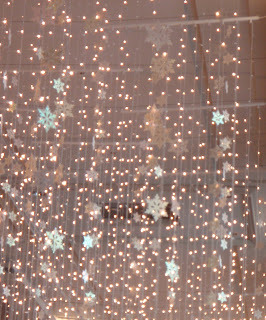 And sometimes, like with this display of hanging lights in the Prudential Building, you can still enjoy the "snow". ... we're in for more snow. taking a break between snow storms. Over the summer, a very large statue of King Lear was displayed in Pioneer Court on Michigan Avenue. King Lear was recently replaced by an extra large three dimensional version of American Gothic. The small plaque says that the name of the sculpture is God Bless America by J. Seward Johnson. It's copyrighted by The Sculpture Foundation. I couldn't find anything about this sculpture on their site but I did find the King Lear statue there. I took this picture during Tuesday's winter storm. Another snow storm is expected this afternoon. That pitchfork isn't going to do the poor guy any good - he needs a shovel! But, since they have a suitcase, maybe they are headed to a warmer climate. This is the Trump Tower. 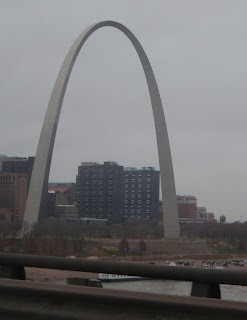 It should have a spire on the top. It was scheduled to be installed on Saturday (12/13) but wind gusts of 50 mph (at that altitude -- it was only gusting to 30 mph at ground level) delayed it. Maybe Sunday, they said. But Sunday was quite windy, too. Given the current forecast for this week ... well, maybe they'll be able to install it in June. There's a place called Architectural Artifacts in Chicago that has lots of interesting things that they've salvaged. 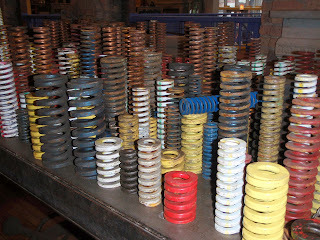 For example, here is a large table full of industrial springs that they sell for $2 an inch. Someone more creative than I could surely come up with a non-industrial use for these. Last night was a full moon. According to the news, the December full moon appears to be the largest due to the location of the earth to the moon. 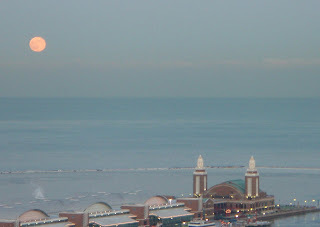 The sun was setting as the moon was rising so the moon gets a little pink coloring. There was some cloud cover right at the horizon, which obscured the "moon rise", but did lend some subtle pink to the sky, too. Sorry, I couldn't resist the title. I haven't seen the downtown rabbits in awhile. The rabbits used to take over Grant Park and do a lot of damage to the trees there. The city hired a consultant to help control them. 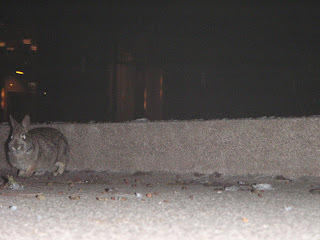 This is by the Illinois Center complex and there were about 5 rabbits munching and hopping around. I used to see them this far west only during the summer Grant Park festivals. I look at things now. Before starting this photo blog I would walk down streets in my own world -- seeing my surroundings but not really looking. Now I look. A lot. There's much to see! 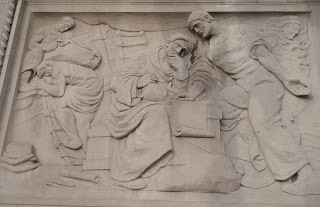 For example, this is a bas-relief that is on a building at North and Pulaski. I tried some online searches to see if I could find more information about this scene, but was unsuccessful. It has a "shipping industry" look to it. The people on the left look like they are unloading cargo via a rope ladder. The guy in front has an anchor on his chest. There are many of these throughout Chicago and I know I've passed by several but never really looked all that closely at them. Now, I want to find out more about them. It was another gray day in Chicago. And, if not for this picture from last Thursday, I'd have had to post another monochrome picture. This has such bright and cheery colors, I thought it would be a good break from the shades of gray we've been experiencing lately. 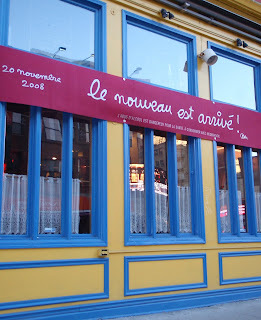 Oh -- the sign is announcing the arrival of the 2008 Beaujolais Nouveau, which celebrates the end of the wine harvest and is always released on the third Thursday of November. This morning's winter rain created some low lying clouds. 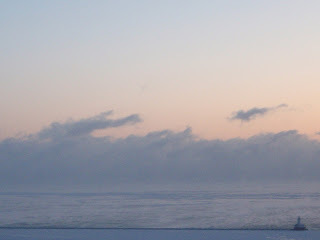 The temperature shift created fog on the lake. 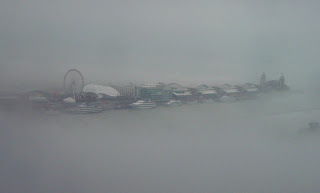 The result was a mirage-like vision of Navy Pier. 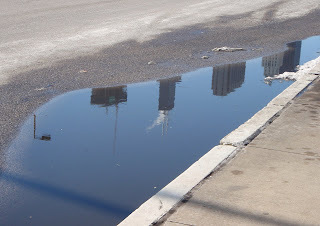 A few days ago I went through all the photos on the other Chicago sites in City Daily Photo. I wanted to make sure I wouldn't be duplicating too much. There were probably a dozen or so already there that I had included in my mental list of shots that would be interesting to include. So I won't be doing those. I also learned that you can stock up on pictures just in case there are days you can't or don't want to go outside. 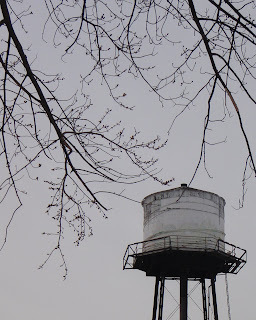 So this weekend, despite the cold, I ventured out on a photography spree. I didn't stock up on many, though, because it started to feel too forced -- like I HAD to find a picture instead of capturing a scene to share. At least I wasn't the only one out and about with a camera on a frigid day. 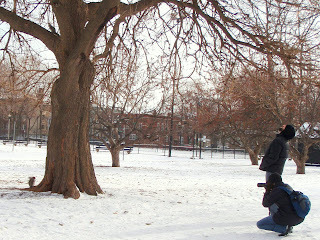 I stopped to take a picture of something else in Welles Park. On the way back to the car I saw this couple also taking pictures. I like how she's taking a picture of the squirrel on the ground and he's looking up in the tree at the other squirrels - there were at least another four scampering around up there. There's another squirrel in the top left hand corner of the picture - in the crook of the branches - just ignoring this whole scene. I wanted this to be a better picture. I was planning on taking a picture of the Chicago Spire-To-Be, which is now just a hole in the ground. I was taking a number of photos when - all of a sudden - something else started creeping into my viewfinder. 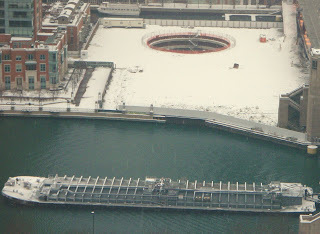 I hadn't even noticed the barge coming up the Chicago River. Since this isn't an every day occurrence, I decided to shoot what I could and see what I got. 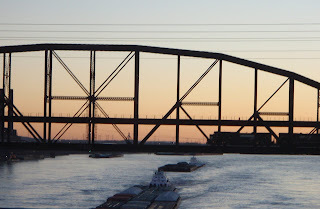 I barely fit the whole barge in the picture. You only see the bow section of its tug. I wish I'd focused more on the barge and less on getting the Spire-To-Be and the barge. That's why this picture is called A Learning Experience. By zooming in, I learned that this barge is the Robert F. Deegan. I "googled" that name and found a web site that reports vessel traffic from the Straits of Mackinac (the stretch of water where Lake Michigan and Lake Huron meet that separates the Upper Peninsula from Lower Michigan). The Robert F. Deegan was up there in early November. 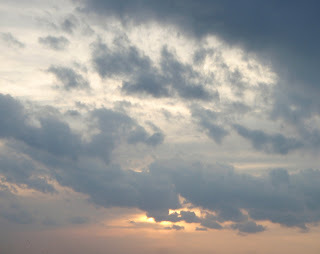 I told myself when I started this blog that I wouldn't do any skyline pictures. This isn't really a skyline picture, though. ... with almost no ripples? I'm just lucky that a bus didn't go by and splash my picture all over me! In and of itself, this is not that unique. A building under construction in Chicago. 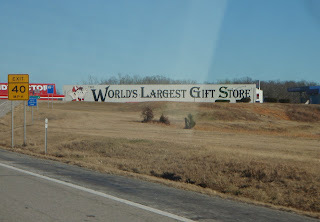 Big Deal. They're all over the place. This one is a little different because the building was already finished - sort of. This is the Blue Cross Blue Shield Tower on Randolph and Columbus. 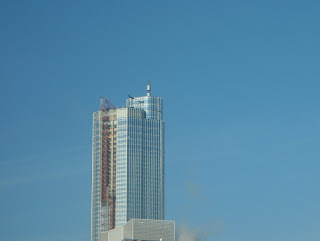 The first part of the building (the first 32 floors) was completed in 1997. The building was specifically designed to be expandable - upward - when needed. Earlier this year they started working on the expansion. I understand they are adding another 24 floors and that it will be done in 2010. Perhaps because this is their corporate office, or because it is a high profile expansion (how many buildings add practically another building on top of an existing one? ), but they did a very nice job on camouflaging the ground level scaffolding. You can't see it in this picture (perhaps that will be a future daily photo) but from the sidewalk, the metal scaffolding is hidden under gray boxes that look similar to the existing pillars. The Green City Market is one of my favorite farmer's markets in Chicago. In November, they move into a large heated tent by the Peggy Notebaert Nature Center for the weekly Wednesday and Saturday markets. 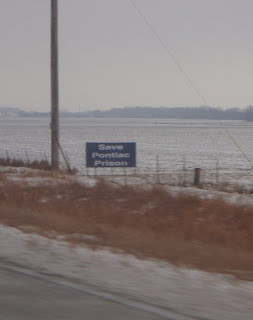 This winter, they will try to keep going twice a month through April. 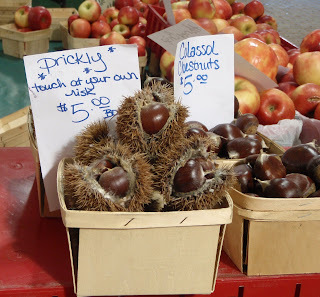 One of the vendors, Hillside Orchards, has chestnuts for roasting, as well as chestnut flour and chestnut flakes for baking. Chestnuts grow in these prickly pods. Hillside shows them with and without these pods. Despite the sign, and the dangerous look, people still touch them ... apparently to make sure they are really sharp! Welcome to another Daily Photo blog from the City of Chicago! Chicago is such an interesting subject for the camera's eye that there is surely room for a few daily picture blogs from here. I just hope I can keep up with the daily part! Boaters usually think empty harbors are a sad sight. It means boating season is over and the days will be dark and motionless for six months. Everyone gets their land legs back and I've heard tell of "Why Aren't Our Boats in the Water?" parties being held in February to break the cabin fever. 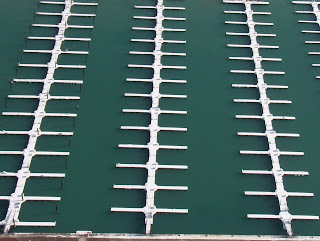 However, I found the sight of rows and rows of empty slips and snow-covered finger piers slightly hypnotic. Truth be told, it's actually the reason I decided to start this blog.